by Kimberley Freda OPB June 3, 2016 9:04 p.m. | Updated: June 7, 2016 10:32 a.m.
for the track where the incident occurred, which revealed a number of issues but no actual violations. Crews are removing rail cars from the site Saturday. 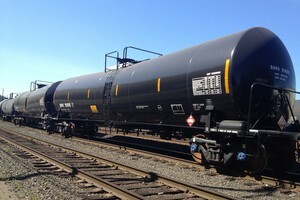 When the rail cars cool, oil will be offloaded from the remaining rail cars to tank trucks, according to ODOT. 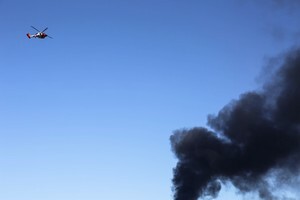 Bakken crude is more hazardous to move than other types of oil because it’s highly flammable. Crews have to wait for the oil to burn, cool down and then apply a fire suppression foam. During that time, explosions are possible. 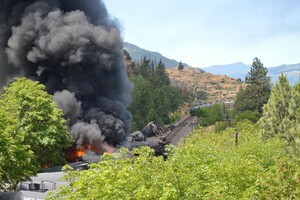 The fire was extinguished as of Saturday morning and ODOT reopened Interstate 84. New federal regulations about transporting crude oil recently eliminated a rule that required oil companies to file notices about crude, including the amount, its intended route and the frequency of its travel. ODOT has since created a rule that requires railroads to file quarterly reports detailing shipments of hazardous materials. This was the first major event since lawmakers approved funding for a hazardous materials incident plan last year. If approved, a proposed oil terminal called the Vancouver Energy Project would be the largest oil-by-rail terminal in the country, based in the Port of Vancouver. It could move 360,000 barrels of Bakken crude oil from North Dakota, through the Columbia River Gorge and onto ships bound for refineries on the West Coast. A new report from the Washington Attorney General’s office shows an oil spill on the Columbia River could cause $170 million in damages. 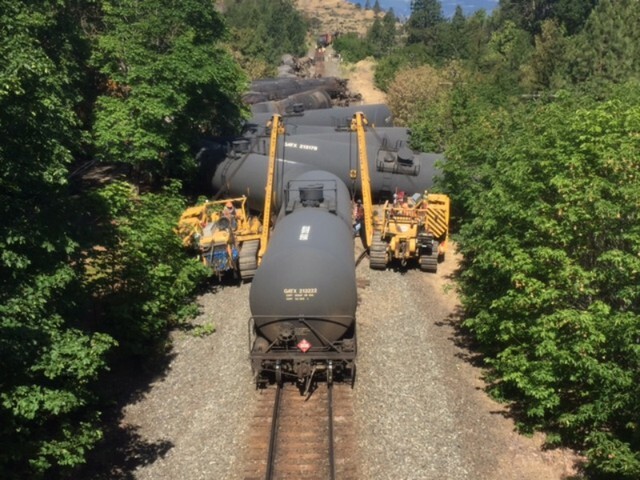 Initial reports from the train derailment in Mosier say it didn’t cause any oil to go into Rock Creek or the Columbia River, but crews set up absorbent booms in the event that oil makes its way to those bodies of water. The Washington Department of Ecology indicated that a sheen was visible six feet offshore in the Columbia River at the mouth of Rock Creek. The report shows that a similar incident could spill up to 850,000 gallons of crude. The worst place for a spill is the Bonneville Dam, according to the report, because the turbines would mix the crude oil into the river water killing more fish and wildlife. Editors note: This story has been updated to reflect the latest information.